For all of you inquiring minds, especially children. I frequently receive inquiries by e-mail regarding Swans, the birds. Most often, the queries come from pupils. They ask questions about the name of a mother Swan, the baby Swan, a group of Swans, and they invariably ask for pictures. Anyway, in the spirit of the holidays and in the hope that I can answer all these questions for good (so that I need not repeat myself time and again), here it goes, with my very best wishes to all. The mother of a swan (female) is called a pen. 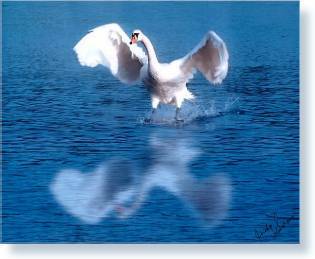 The father of a swan (male) is called a cob. Young swans are called cygnets. A swan's beak is called a bill. Please check http://www.taiga.net/swans/head_and_bill.html to learn about the different bills swans have. A group of swans is generally and generically called a flock of swans; but, according to the Oxford English Dictionary, the correct appellation is a wedge of Swans (when they are flying in a "V" formation). I've also heard of a bevy of Swans but I am not certain this is correct. A bevy usually refers to a group of larks or quails. So, I am afraid that I can't bring a definite answer on this one. Here, on the Swans Commentary Web site, we refer to the flock; that is, the collective of writers and essayists who generously contribute their work on a bi-weekly basis. Anyway, for those of you who wish to learn more about Group Names of Birds, please visit http://baltimorebirdclub.org/gnlist.html; and you can also check out James Lipton's An Exaltation of Larks from your Public Library. Lipton describes in great details these collective nouns that have embellished the English language for centuries. I am sorry if I cannot provide you with pictures of swans. Our site is not geared toward this function. We do have one though, and I am more than happy to show it to you. You may want to learn more about these gorgeous birds and see myriad pictures (always ask permission if you want to use the material displayed on the respective sites). So I have compiled a few links that you should feel free, and hopefully eager, to peruse and explore. And of course, when you want to read out-of-the-box ideas, when you are ready to dream and invent the future, we will be honored to have you visit us at Swans Commentary!